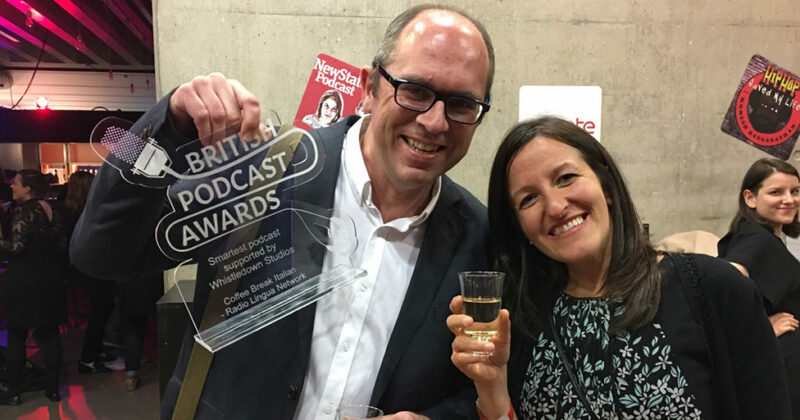 The British Podcast Awards took place last night in King’s Cross, London, and Coffee Break Italian was named Smartest Podcast 2017. Mark and Francesca were there to collect the award on behalf of the whole Coffee Break team. The gold goes to a completely new and novel use of the medium of podcasting with an approach that was light, funny and enjoyable which truly makes listeners more smart and informed, beyond their next dinner party. Other winners included Mark Kermode and Simon Mayo’s Film Review podcast from the BBC, audioBoom’s Hip Hop Saved My Life with Romesh Ranganathan and The Inquiry from BBC Current Affairs for BBC World Service. Special thanks to Olly Richards from I Will Teach You a Language who joined the Coffee Break team and helped us film a special episode of Coffee Break Conversations. PrevPreviousCBG 2.06 | Was hast du gestern gemacht? Mark e Francesca, voi siete insegnanti bravi! Well done Mark and Francesca! You have the best Italian podcast bar none! Love the format, the pace, the way the lessons support each other and build upon each other! Complimenti! Congratulations Mark and Francesca!! Glad to see they awarded you two. You deserve even more awards for Coffee Break French, and Spanish and other languages too. Truly happy for you. Complimenti. Più episodi per favore!